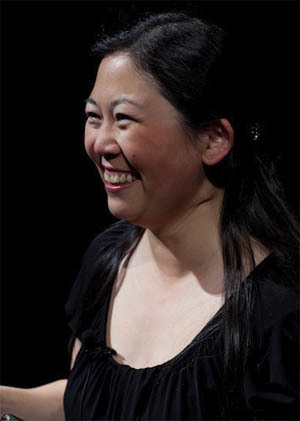 Yiyun Li is most recently the author of Gold Boy, Emerald Girl. Condition of Mr. Segundo: Confusing golden boys with golden tickets. Li: The way I look at fiction is that the most dramatic moments do not come from physical or real dramas, but from internal dramas. And those moments are actually quite still, if you look from outside, and those are the moments I like to write about in fiction. Correspondent: I’m wondering why narrative scenarios or stories tend to come more from that than, say, a natural collision of ideas. Or a natural collision of two characters arguing in a coffee shop or something. Li: Right. I think with that scenario, if you have two characters, or two ideas, bumping into each other, there’s no space for them to stop. It’s like a train wreck. It’s like a crash. As a writer, you have to follow that. Which some writers do really well — following in that crash. By nature, I don’t think I follow that crash. But I like the aftermath of the crash. Or right before that crash. So I don’t follow the event. I follow the crash within the crash, in a way. Correspondent: Do you feel that — if you had, say, an obvious crash, like two people — that this might complicate a narrative situation that you’re forming in your head? Or something like that? Do you work better from a minimalist narrative scenario than, say, a rather complex one? Correspondent: Have any sentences or any character developments emerged in your head from a noise? I’m curious. Li: Oh, that’s so funny. No! I think oftentimes that the characters start with a very quiet moment. I don’t think I have — oh, I would say the counterrevolutionary who was sentenced to death in The Vagrants, she was the only one of my characters, I think, that had a little bit of noise in her. I mean, her experience was quite noisy. Loud. So she was the only one. Correspondent: I mean, this is very interesting. Because I actually wanted to remark on one thing I’ve observed in your work. A very slight internal rhyme to your sentences. And I’m going to dig out some examples here to show that I’m not some paranoid, crazy freak here. “Spring in Bejing was as brief as a young girl’s grief over a bad haircut.” That’s in “Number Three, Garden Road.” In “House Fire,” “the court, as the last resort.” In “Kindness,” “I fumbled under the bundled clothes.” Not exact. But close enough. I mean, you mention sound. I’m curious how rhyme along these lines helps to anchor a sentence for you. How a sentence is formed based on this rhythm. Because there is this really wonderful rhythm, I think. And it comes out more directly to the reader, I think, with the internal rhyme. Li: Right. So the question is somewhat about how do I come up with this sentences. Correspondent: Yes! How does this musicality come about? Li: Right. I think one thing is I have to write to the music. I actually imagine the music of my stories. Li: And that’s one thing that’s really important. I’m not a visual writer. So I don’t imagine the images. I imagine the rhythm and the tone. So in a way, I think, you just have to push a sentence to match to the music in your head. Correspondent: Aha! So you literally have the song going on. Correspondent: There’s a musical phrase right there. Correspondent: You have to get the sentence matching up exactly. Correspondent: Even if it’s diatonic. Li: Right. It’s almost like the sentence has to talk to the music in my head, rather than anything else I think. Correspondent: Is this why it often takes you so long to come up with a sentence or a story? Because you’re so exact like that? Li: I am. I think I do pay a lot of attention to the sentences. And I also listen to music. Like sometimes I would choose a specific piece that would match the mood of the story. Or to the novel. I’ll listen to it again and again until I get it. The sentence and the music. They sort of have the conversation. Correspondent: So I’m curious what kind of music is going on in your head. Are we talking the Ramones? Are we talking classical music? Li: (laughs) Well, this is a little confession. My first book was written to U2. Li: I was listening to U2 songs. Li: Actually, all albums of the time. Li: You know, my husband would make all these files on my computer. So I would have all the U2 sounds. And I would just go over and over again. While I listened to U2, I would write. That’s how my first collection came into being. But then I think my music has changed since then. Now it’s more classic music. I listen to Tchaikovsky a lot. Because I feel very close to his music. And Brahms is oftentimes in my accompanying pieces. And Mahler. I wrote one story — “Kindness,” the novella in the new collection — completely to Mahler’s Symphony No. 1. Correspondent: Which Tchaikovsky? The 1812 Overture? Correspondent: I knew it. That’s so fitting in light of the depressed nature of the characters. Li: Yes. Tchaikovsky is really close to my mind, I think. I don’t know. His music moves me just beyond words. Correspondent: I’m curious if you have thought to find composers and artists who are oppressed in some ways — as Tchaikovsky was.